Born in Argentina, Mabel Katz is an internationally acclaimed speaker and television show host based in Los Angeles. She is the author of a series of five books about a Hawaiian spiritual practice called Ho’oponopono, the first of which has been translated into more than 20 languages. She delivers seminars to teach individuals how to achieve “inner peace in order to promote world peace.” She has travelled to speak about peace in more than 30 countries and 60 cities throughout Europe, the Middle East, Asia, and North, Central and South America., and has received a number of awards, including a peace flag from Mil Milenios de Paz in 2012 and Knighthood from the Russian tradition of the Knights Hospitaller for her work with children and world peace. In 2011, Mabel spoke before the United Nations, launching her world peace initiative, Peace Within Is World Peace, and offering the Flor-de-Lis as an easy tool to access inner peace. The response was immediate, positive, and overwhelming. Thank you Mabel Katz for showing up in my life. Peace begins with ME. Peace within IS world peace. Gracias Mabel. Tus palabras dia tras dia en el facebook me ayudan a no desviarme de mi proposito de borrar y ser feliz. Pase mucho tiempo perdida y al fin me encontre. Hoy todo esta bien y todo se ve mejpr incluso en quienes me rodean. Gracias!!! I’ve been following Mabel since many years and I’ve interviewed her in our country, Argentina, in my radio program,”Mujeres Atrayendo Riqueza” (Women attracting wealth). We celebrate her nomination and wish her the Best as she’ll be a significant ambassador as she is such a giving person. Good luck Mabel!! We are proud of you and your work!! Love your site, your beliefs, and You. Mabel! thanks you for your love and work! Gracias Mabel, y buena suerte. Mabel changed my life forever. I have learnt Peace, love and gratitude beyond all understanding and I am forever grateful. Thank you so much Mabel. Thank You Mabel for reminding me that peace helps in every moment and issue that faces us ! Love your site, your beliefs, and You. Thank you, Mabel!!! Thanks for everything, Mabel. With Love. We salute Mabel Katz’ work and efforts in the area of International Peace. Life for me and those around me has bee so much better since I have been following the Hooponopono teachings, thanks you, thank you, thank you. Mabel Katz is a peacemaker. Gracias Mabel por estar en mi vida. Te sigo desde hace años y me ha cambiado la vida seguir tus enseñanzas. Las herramientas que nos enseñas me ayudan dia a dia y veo lo milagros en mi en mi entorno. Tenemos que seguir asi, limpiando dia a dia para un mundo mejor. Funciona! Gracias, merci, shukran, thank you, danke! ¸.Ƹ̴Ӂ̴Ʒ Köszönöm ♡ Szeretlek Ƹ̴Ӂ̴Ʒ ..
Estoy agradecida de que Mabel haya aparecido en mi vida y a través de ella conocer q podemos estar en paz aunque a nuestro alrededor todo se derrumbe. Gracias Mabel por tu ayuda y tu soporte. I have known and been practicing Mabel’s method for 14 months . My life has significantly changed since then. Mabel travels the world, teaches those interested, her followers, longing for love, inner peace and for being conscious, because we will be wiser that way. She teaches: by leaving our inherited memories, and cleaning our brain, these memories will be cleaned from others, as well. If we change, we can change the whole world. If we are in peace, everything around us will be in peace. And all these things together lead to the world-peace. Mabel is the person who not only speaks about world-peace, but also acts for creating it. She is the most commited and open-hearted believer in creating of peace. Mabel does much to promote peace — first within ourselves and then spreading that peace to others. I believe she deserves to win. Thank you, Mabel!! 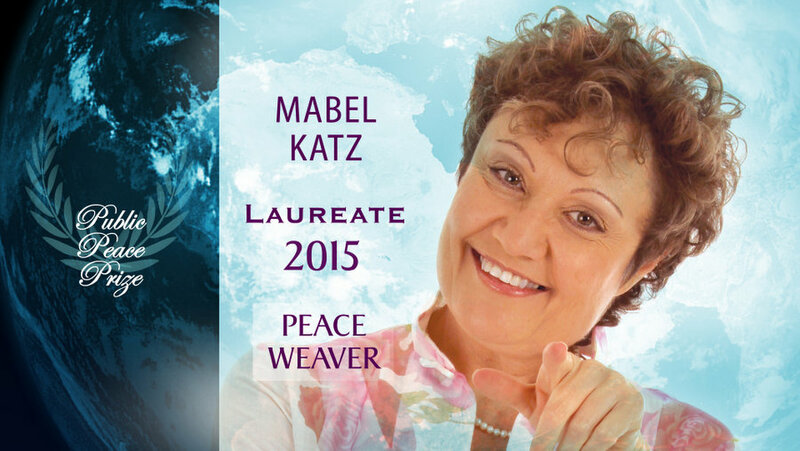 Mabel Katz worthy of the title of Peacemaker 2015 and receive Public Peace Prize! MABEL TE QUIERO MUCHO. GRACIAS POR TUS ENSEÑANZAS, HICISTE QUE ENCONTRARA LA PAZ EN MI, GRACIAS GRACIAS GRACIAS. Gracias Mabel por hacernos esto fácil, de poder comprender un poco a través de un ser como tu, tan comprometida ya a la ves tan cerca nuestro, mi identificación con todo esto es gracias a haber conocido esta filosofía de vida tan bella, la verdad antes de conocerla yo no creía de corazón en nada, por supuesto no confiaba, ahora esto, me ha traído paz y aceptación y como resultado bendiciones.